"On moving in to our new home, we were keen to reduce our running costs and environmental impact as far as possible. We approached Solar and Wind Applications who expertly guided us through the design process and equipment recommendations. They made it clear that our East and West facing roof was a benefit, as it increases our self consumption savings. The installation was carried out promptly, neatly and exactly as discussed. After a few weeks of the system operating since installation this Spring, we've generated almost all of our own daytime electricity. Any excess generation has provided constant hot water too via EMMA. We are delighted with every element of the process and the performance!" Our customer approached us after receiving a move in date to their new home. As part of their move, they were keen to minimise their electricity consumption and running costs of the home as far as possible. The new build house has roof pitches facing East and West. 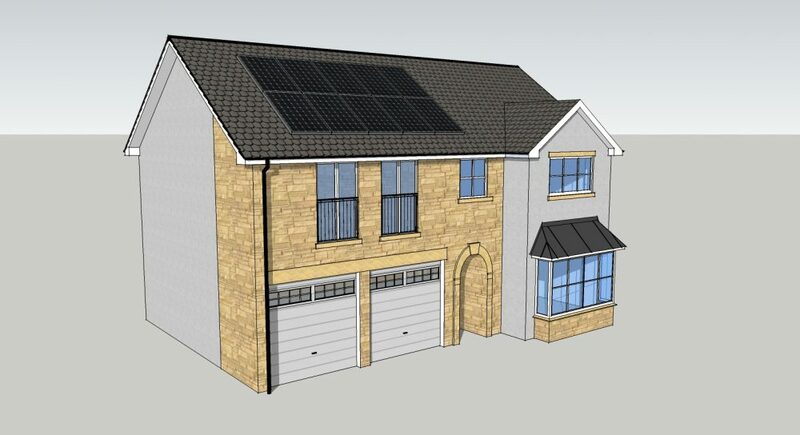 This allows a Solar PV system to have split orientations, meaning that the generation profile is expanded over more hours of the day compared to a single south facing array – East catching morning sun and West in the evening. They’ll both be working in the middle of the day. Due to most domestic situations having peaks in electricity consumption morning and evening as well as constant “base load”, this layout means that self consumption of the generated electricity is maximised, reducing the quantity of expensive imported electricity required. It was therefore decided that a split system as large as possible be installed to reduce import of electricity as far as possible. The home is fitted with a gas system boiler and large hot water cylinder. Due to the likely generation compared to consumption over the summer months in particular, it was also deemed worthwhile to divert excess solar energy to the immersion heater using an EMMA, which also provides excellent monitoring of the complete system. 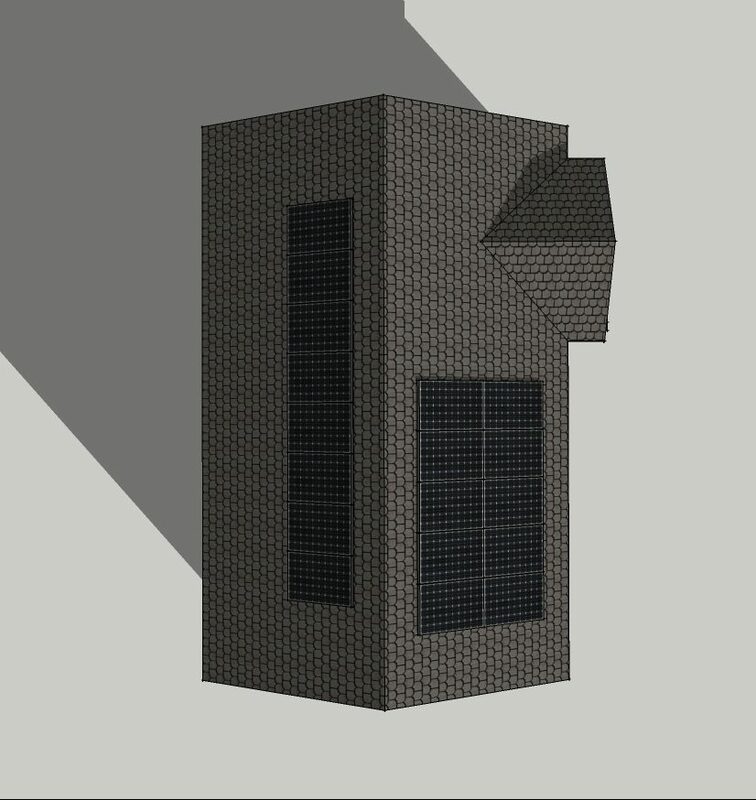 Along with quotations for the works, we provided all technical details of the installation, including 3D modelling of the proposed Array installation, see images. We chose the Solar Edge Optimised inverter system for numerous reasons, but significantly influenced by safety, convenience to install, and long warranties. The monitoring system also provides superb module level information so that our customer, as well as us as installers, can ensure the system is working correctly. This system will significantly reduce the requirement for imported electricity. Due to the size of the system even in low light there will be sufficient power generated to cover base loads for almost all daylight hours – significantly more than with a South facing array only. The system over the course of a year will generate in the region of 3,500kWh. As this is a new home the load profile is not known, but it’s estimated that with EMMA to proportionally consume the “excess” generation that around 80% or more of this will be consumed on the premises, by appliances or heating water. As a result of EMMA, it’s expected that the gas boiler will not be required for around half of the year for water heating purposes, reducing fuel cost as well as wear and tear on the boiler. We provided complete support and installation for the whole solar PV and EMMA system.